Last week I had a call with Parallels, which was my first briefing with them in quite a while. I'm a Parallels Desktop user on my Mac, but besides that Parallels rarely comes up in the desktop virtualization space outside of that (other than a few "what if" scenarios from time to time). Last week I had a call with Parallels, which was my first briefing with them in quite a while. I'm a Parallels Desktop user on my Mac, but besides that Parallels rarely comes up in the desktop virtualization space outside of that (other than a few "what if" scenarios from time to time). What I learned was that earlier this year they released a product called Parallels Management Suite for Microsoft System Center, the main feature of which is to allow you to manage Mac endpoints via Microsoft SCCM. The product works by installing an agent on the Mac endpoint that is either deployed manually or via a network discovery install. In the latter scenario, SCCM is directed to discover macs on the network, establish an SSH connection to them with predefined admin credentials, and install the software. After the agent is installed, admins are able to deploy software and scripts, inventory software and hardware, and take advantage of SCCM's native reporting functionality. Many of the tasks available to Windows admins are also available to Mac admins. The only caveat to application deployments that I was made aware of is that the application must support silent installs. I'm not sure how many applications this eliminates from consideration, but I did confirm that you can package Automator scripts that can be used to automatically install applications that require user interaction. This sounds great, but it isn't the only product on the market that integrates Macs into SCCM. In fact, it's not even the only product from a vendor in our coverage area. When Dell acquired Quest, they also acquired QMX, which is as close to the same product as possible. There are some key advantages that QMX has at the moment, though. First, QMX can deploy OS images to the endpoints. Second, QMX also features management extensions that support iOS and Android devices. Both of these features are on the road map for Parallels Manage Suite, but are not yet part of the product. What sets it apart from QMX, though, is the ability to manage the hypervisor component and deploy virtual machines, too. I don't mean to imply that it's not possible for QMX to do this via scripts, but Parallels has specifically added functionality to manage Parallels Desktop Enterprise from SCCM (not the cheaper Parallels Desktop). 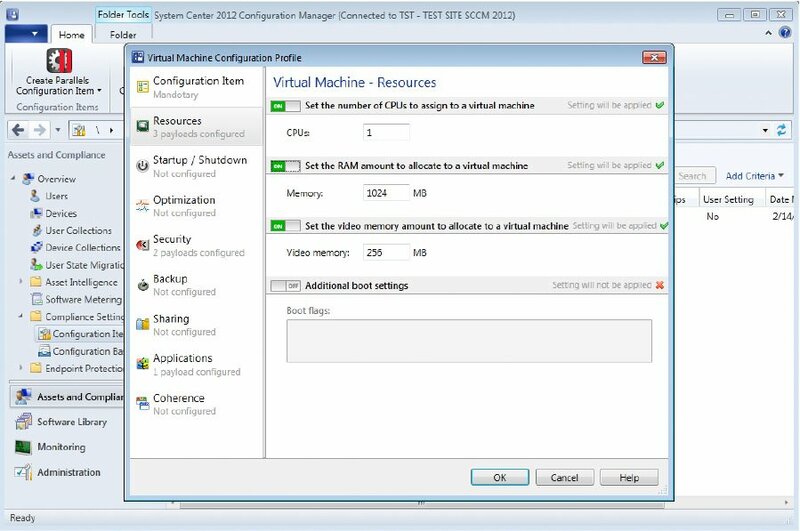 This includes both managing the hypervisor configuration itself and deploying virtual machines. Parallels Management Suite also adds remote support, which I don't believe is a feature of QMX (although I could be wrong). Still, the only way to de-provision a virtual machine is with scripts. That, combined with the fact that the management agent must live on the host (so the entire device is managed by SCCM) means that this is probably not a comprehensive BYOC solution yet. Future updates, I hope, will bring the ability to manage the hypervisor on machines that are not domain-joined, like contractor laptops. Parallels doesn't have a Windows client hypervisor product, so it would be welcoming to see that or to some other integration with VMware, VirtualBox, or Client Hyper-V, if only for the sake of VM portability. Still, it's interesting to see some movement in this space beyond Dell QMX, and I think that centralized management of Macs has value in many organizations, especially when you combine that with centralized management of VMs. Prior to this product, you'd have to have multiple solutions (like MokaFive Suite + QMX), but Parallels is trying to bring it all together into one solution. You can argue that QMX + MokaFive gives you more features, but that also brings added complexity. Don't forget, too, that VMware is making waves in the Mac BYOC/Client Virtualization space with VMware Fusion Pro and Horizon Mirage, so I expect to see some back and forth here. Parallels Management Suite is available today, and retails for $30/user. It works with System Center 2007 and 2012. Hi Gabe, there is one inaccuracy in your article. Parallels Management Suite can manage Macs that are not domain-joined. When enrolling Mac into SCCM via manual enrollment a user will be asked to provide AD credentials. But his Mac don't have to be domain-joined. You might want to check out SCCM SP 1. It does req certs, but allows inventory and software deployment to osx. Hopefully future versions will support OSD.